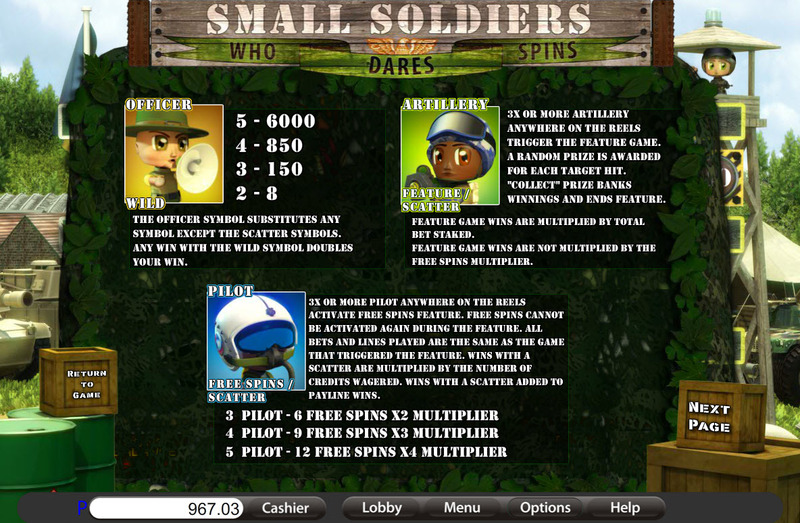 Overview: Small Soldiers is a military-themed video slot that can only be described in one word: irresistible. 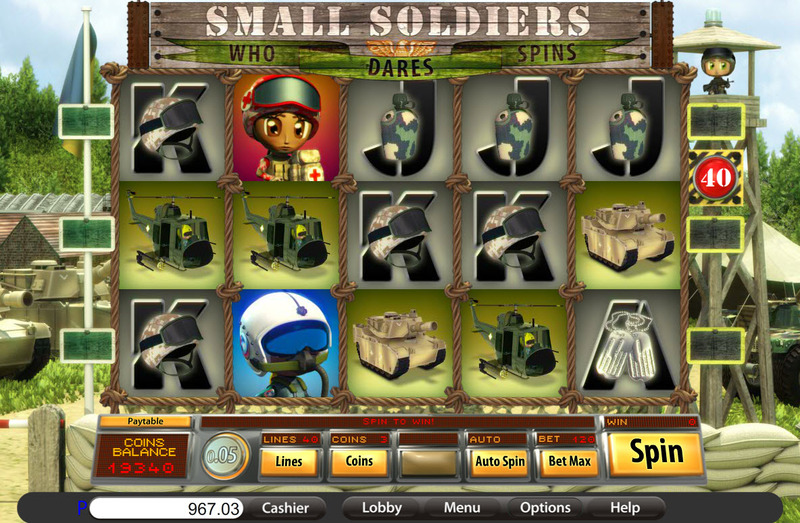 This quirky slot features a cast of fun-filled cartoon soldiers, cool military hardware and a toe-tapping soundtrack guaranteed to make you smile. 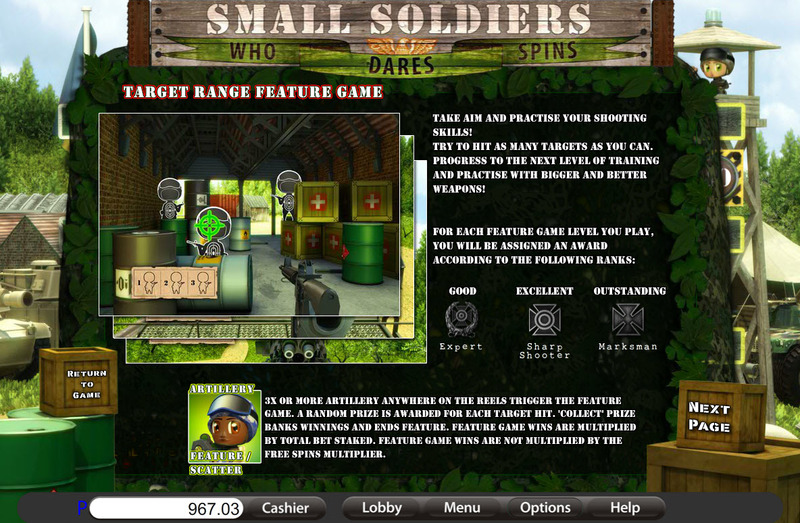 Small Soldiers is played through a series of tiers - while offering loads of fun. 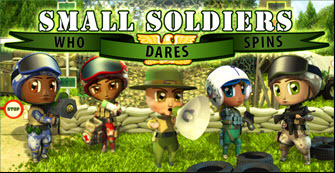 Trucks, obstacle courses, jets, helicopters, and an interactive target range (which is the feature game), all combine to create a magical and hilarious experience on a military base populated by the immensely appealing Small Soldiers. This 5-coin, 40-line feature offers up to 12 free spins with a 2X, 3X or 4X multiplier - not to mention the Wild, which is also a 2X multiplier. The riveting target range feature game offers multiple progressive levels, and the potential winnings are massive, with payouts of up to 30,000 coins! Fantastic graphics, effortless play, and brilliant design, all combine to offer you an incredibly entertaining video slot. As Small Soldiers reminds us: Who Dares, Spins! 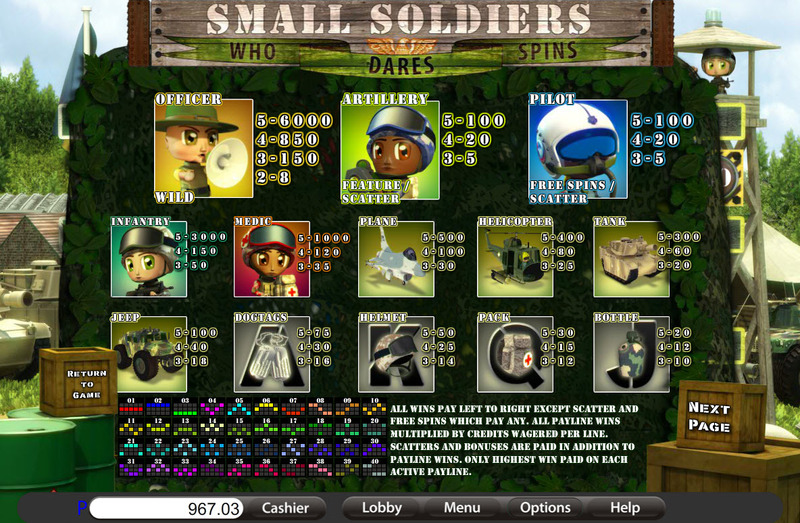 Similar Slots: If you like Small Soldiers, you might like these other slot machines from Saucify: Code 211, Dollar$ Down Under, Reels of Rock, Road Trip, Tails of New York, Trick or Treat.